Attleboro, 61 vs. Bishop Feehan, 48 – Final – Attleboro had six players scored eight or more points, and used a mini-run in the fourth quarter to pull away from the Shamrocks. Up 49-42, the Bombardiers put together a six-point surge that put the game away with just over two minutes to play. Sophomore Bryant Ciccio had a team-high 15 points while classmate Qualeem Charles had eight points and 17 rebounds. Junior Dom Victor added 12 points and eight rebounds, senior Nate Douglas and junior Mason Houle each scored nine points and senior Elvin Sam chipped in with eight points. Foxboro, 48 vs. Shaler Area (PA), 37 – Final – Foxboro limited Shaler Area to just 14 points in the first half and just 25 points through three quarters to win its bracket in the KSA Holiday Tournament at Disney. Senior Joe Morrison dropped a team-high 14 points and was named tournament MVP. Bobby Harrison added eight points and sophomore Ryan Hughes chipped in with seven points in the win. North Attleboro, 64 @ Lincoln-Sudbury, 59 – Final – North Attleboro saw its eight-point lead shrink down to just three with 20 seconds to play, but junior guard Josh Montague hit a pair of free throws to tie a career-high with 25 points, helping the Rocketeers win the Warrior Winter Slam championship game. 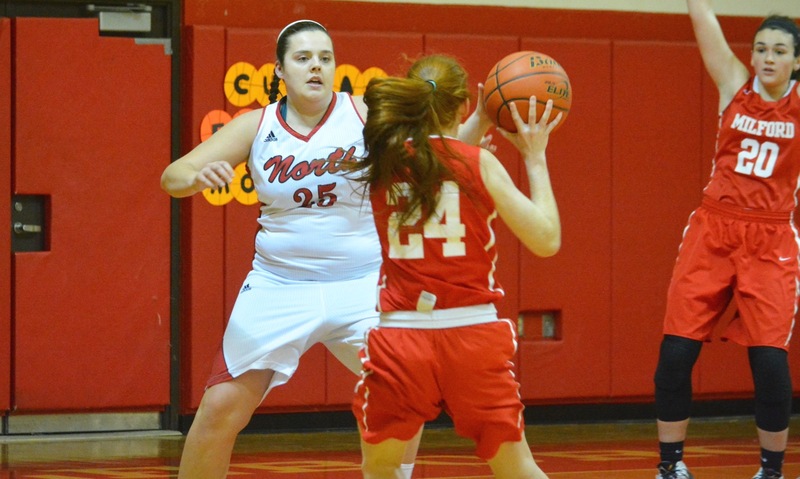 North led 34-27 at the half and 46-38 heading into the final quarter. Montague earned tournament MVP honors while Chad Peterson (14 points) and junior Jake Petersen (six points) were named to the all-tournament team. Sharon, 54 vs. Walpole, 59 – Final – Click here for a recap of the game. Milford, 55 @ Hopedale, 27 – Final – Kate Irwin scored 15 points and had five assists for the Hawks, who picked up a big win over their neighbors. 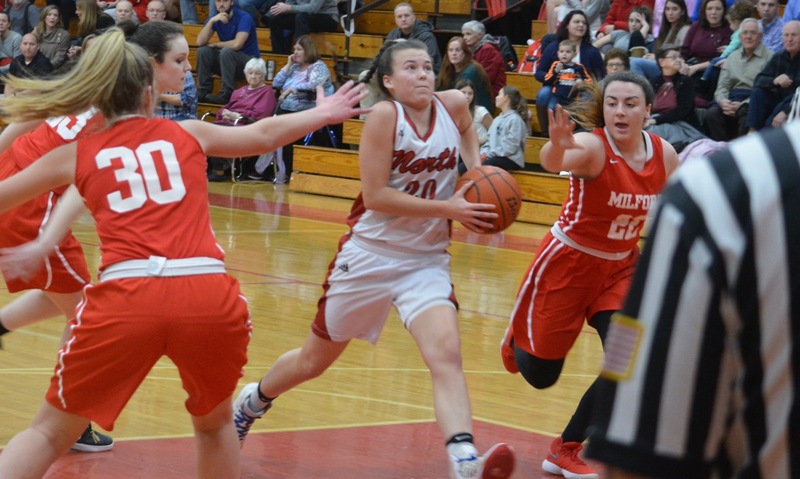 Jess Tomaso scored 10 points and pulled down nine rebounds and Gillian Valanzola had nine points and 13 boards for Milford. 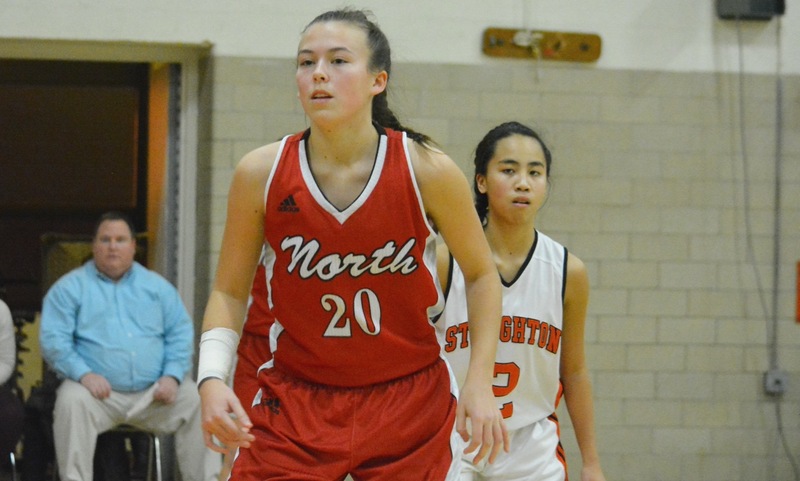 North Attleboro, 30 vs. Westwood, 28 – Final – Julia Feid was the top scorer for the Rocketeers with 14 points to lead North to its first victory of the season. Lowell Holiday Tournament (Canton, Foxboro, Franklin, Stoughton) – Franklin had the best showing among Hock teams, placing seventh overall with 112.5 points. Jordan Carlucci (126) placed fifth overall and TJ Remillard (132) took seventh in his bracket. For Foxboro, senior Phil Dure was eighth overall in the 126 bracket and the Warriors earned 64 points. 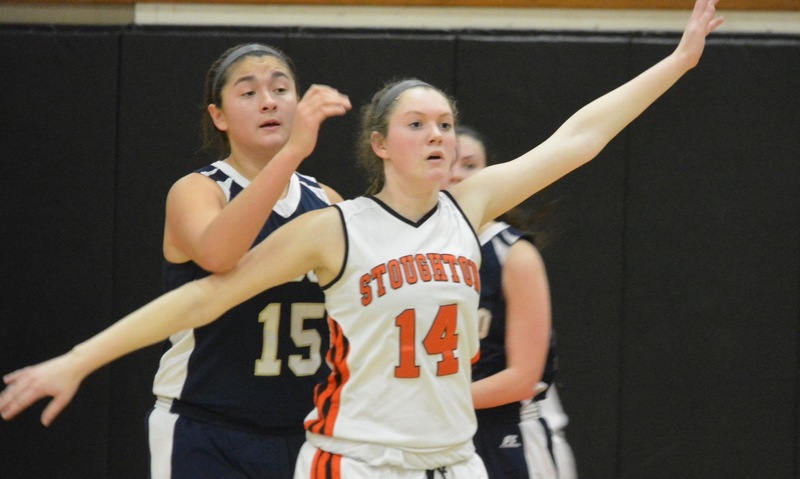 Canton earned 50 points and Stoughton had 31 points. MILFORD, Mass. 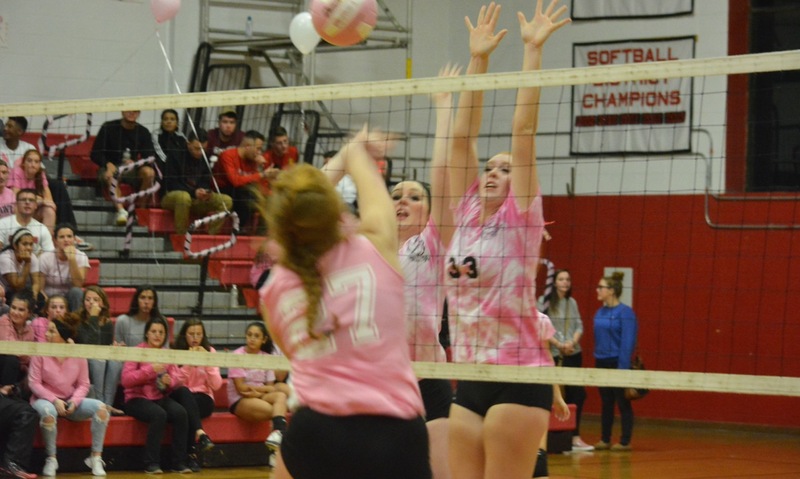 – For the first two or three minutes of the game, it was Milford that looked like the team that had driven more than two hours from Pittsfield for Saturday’s non-league matinee. The Hawks fell behind 6-0 and look a little out of sorts in the season opener. 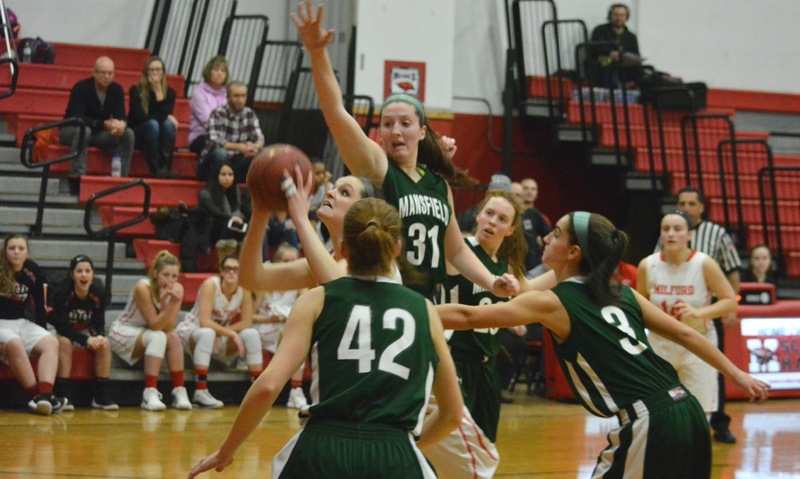 Then senior guard Jill Burley buried a three to cut the Taconic lead in half and the hosts kicked into gear. Milford went on an 18-2 run in the opening quarter to take a lead that it would never relinquish. 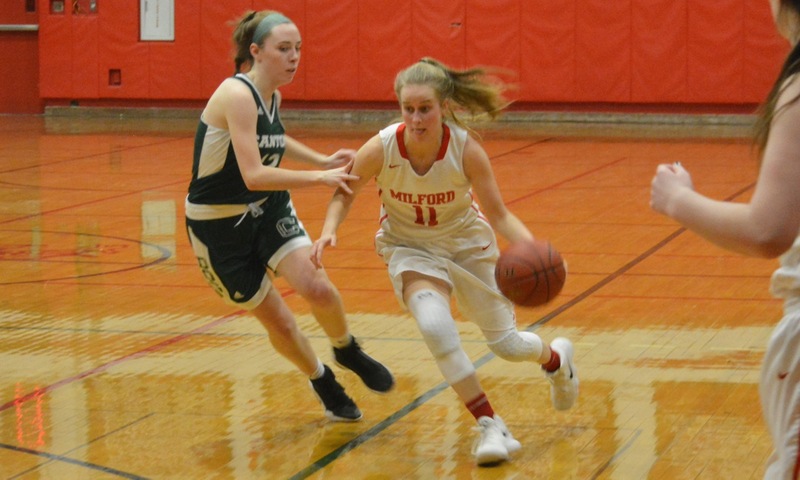 Sparked by junior Kate Irwin’s 21-point, four-assist, five-rebound performance and double-digit rebounds from senior Christine Pye (10) and junior Jess Tomaso (14), Milford held off Taconic 52-45 in a game that the visitors managed to keep close right to the end. “The reason for it was we’re putting them at the line too many times,” said second-year Milford coach T.J. Dolliver of the Hawks inability to put the game out of reach in the second half. Taconic went to the line 19 times in the second half (30 times in the game) and made 10. 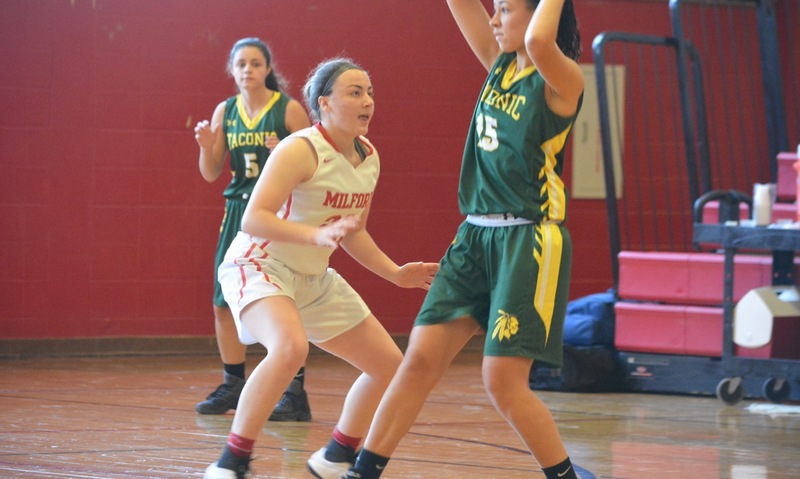 The fouls started in the first quarter with Milford putting Taconic in the bonus before the end of the opening eight minutes and both Burley and fellow captain Nicole Dahlgren (seven rebounds) were forced to the bench for a long stretch due to foul trouble. Milford showed its depth by finding other players to step up. Emily Piergustavo, who missed last season with a shoulder injury, had one of her three first half steals to get Irwin a transition basket and then the combo repeated it to tie the game at 8-8. Piergustavo (six points) buried a three off an Irwin assist to give Milford its first lead and Irwin added another basket off an offensive rebound. Pye scored off a rebound and Gillian Valanzola scored off an inbound pass by Emma Liskov to give Milford an 18-8 lead. Taconic turned momentum around and went on a 10-2 run that cut the lead back to just two points, but Irwin scored with a drive to the left and a Dahlgren offensive rebound and kick-out gave Tomaso (six points) an open look from three to extend the lead back to eight. The third quarter was a struggle for both teams. Irwin buried a three to give Milford its largest lead of the game at 14 points, but the Hawks only managed one more made field goal for the rest of the quarter when Tomaso followed her own shot twice before finishing. Luckily for the Hawks, Taconic was also finding it tough to score. The Braves had only two made field goals and three free throws in the third and could only cut two points off the halftime lead, trailing 35-26 into the fourth. Milford started the fourth like it wanted to finally put Taconic away. Irwin hit a runner and then Dahlgren buried a long jumper. After being forced to the bench because of foul trouble, Burley finally got her chance and buried a pair of three-pointers that put the Hawks up 45-31. If Milford thought the game was done, Taconic had other ideas. After a two-hour drive, the Braves were going to keep it interesting for the full 32 minutes of game time. Taconic was 7-14 from the line and closed the gap to as little as six points with a few minutes remaining, but Dolliver called timeout to settle his team down. Milford (1-0) will try to keep the momentum going at the start of the season in its league opener on Tuesday against King Philip.